A group of protesters in Carlton, Australia have occupied a site designated for a multi-million dollar Lockheed Martin research center to protest the defense industry giant’s growing influence in Australia. The occupation began on Tuesday morning when the protesters made their way into an empty former women’s hospital that stands on a site where the largest Lockheed Martin research center outside of the US is to be built. The Space, Technology, Engineering and Research Laboratory (STELaR Lab) is a joint project of Lockheed Martin, the Australian Department of Defense, the University of Melbourne and RMIT University. The facility, which is to be the first of its kind for Lockheed Martin outside the US, will conduct the Maryland-based defense company’s research and development operations for its current portfolio in Australia. An initial $13 million will be invested over three years to set up the lab, which will explore several fields, including robotics, computing, intelligence, surveillance, and reconnaissance. 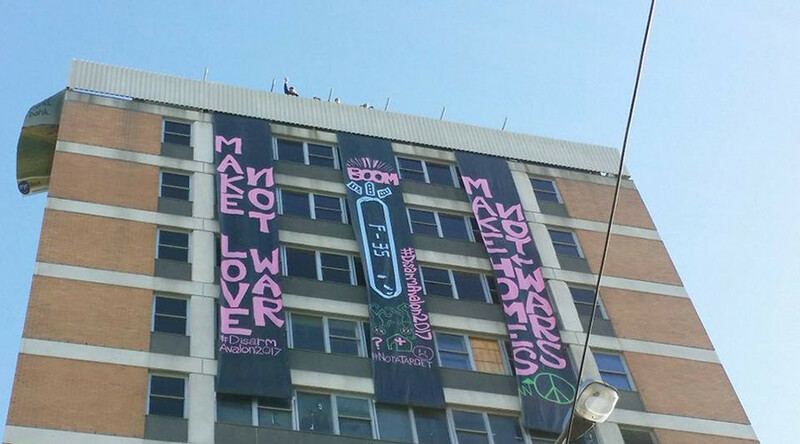 The protest group, which calls itself ‘Disarm’, posted videos on its Facebook page showing activists on the building’s roof, from which they have hung large anti-war banners. They have also set up tents and strung up hammocks to make their stay more comfortable. The protesters, who camped on the roof overnight, said that construction workers arrived at the site at midday on Tuesday, but soon left without attempting to begin the demolition of the building. The group said in a statement that their aim is to halt the construction of the facility. “Lockheed Martin has long been a target of peace activists around the world, who have protested the corporation’s design and manufacture of weapons and military hardware, such as the Hellfire missiles that are used in the current Syrian conflict,” the statement reads. “The government claims that funding the building of this lab is about job creation. We Peace Protectors say it is about preparation for war and that a better way for the government to create jobs is to invest in housing, healthcare, and education,” Jessup stressed. Australia’s commitment to a multibillion dollar purchase of 72 Lockheed Martin-designed F-35A Lightning II stealth fighter aircraft has also raised the ire of the activist group. “At the end of the day, handing billions of dollars over to Lockheed Martin, whether it’s at the University of Melbourne, or buying their expensive and dodgy F35 Joint Strike Fighter is a killer of jobs and growth. It is our taxes sucked straight out of the Australian community into the hands of Lockheed Martin one of the biggest profiteering US corporations,” Jessup concluded.